As I have grown older, I find that my teeth are not as white as they were when I was younger. There is nothing like looking at a a small child who has perfectly white teeth...teeth that have not been stained or damaged. Oral care is and should be a priority in every person's life and if it is not, you will pay the consequences later in your life. Your smile says alot and should always look great. It is often the first thing people see when they look at you and I know that when I see someone with horrible teeth, it often reflects on the way the rest of their body looks. What do you want your smile to say about you? Do you want white and clean teeth? If that wasn’t enough to convince you, how about this? People with white teeth are perceived as 59% more confident on first dates! Luckily, REMBRANDT® has been the leader and expert in teeth whitening since 1987 and can be trusted to help you make the most of your smile, whatever your needs – whitening kits, toothpastes, or mouthwashes. Additionally, REACH® can offer a whitening toothbrush and floss to help whiten while you brush! I have never used teeth whitening products like the ones Rembrandt offers and so I was really interested to see if these would work for me. I have generally had nice teeth and so I have never had to whiten them. However, I have been noticing slight yellowing around the gums and brushing hasn't made the yellow go away. The first product that I tried was the Rembrandt Intense Stain Toothpaste. I noticed right away that it tasted very minty and really left my teeth feeling clean...no residue at all. I also used the REACH® Total Care + Whitening Toothbrush , which was very soft on my teeth. I have a sensitive area on my gums that gets irritated easily but this toothbrush felt great on that area and created no pain at all. This toothbrush is really cool as it features MICRAWHITENING Calcium Carbonate Bristles which help to whiten teeth...just by using the brush! The REMBRANDT® DEEPLY WHITE™ + Peroxide Toothpaste is very different. The flavor tastes like peroxide, definitely no getting around that. Thankfully, the mint flavor helps to take away the nasty flavor of the peroxide. Another thing that I will note here is that the tube itself looks like it is about to burst. This is because the Active Dental Peroxide releases oxygen to increase the whitening results. So, when you open the cap the tube may release air (yes, it "burped" at me!) which is totally fine. Once I found it, I applied it to my teeth. There are very clear instructions so you don't do it wrong and honestly, it is not hard or difficult to understand. The little notch in the strip is your guide to putting the strip on correctly. Once in place, I again experienced the flavor of peroxide but it wasn't too bad at all. I used a strip on the upper and lower teeth and it took about 15 minutes for the strip to completely dissolve. The only thing I didn't like was that my lips were pasty feeling and dry afterwards...other than that, my teeth looked great!! I will admit here that I am HORRIBLE when it comes to flossing. I forget all the time and don't do so well at reminding myself to do it. So, I was thrilled to receive the REACH® Total Care + Whitening Floss. Maybe if I know that the floss will help whiten my teeth I will be more excited to floss??? Who knows. Anyway, this floss is super nice and smooth on my teeth. It seemed gentle enough for sensitive gums and contains MICRO-GROOVES technology so I think it cleans better then other brands. Last but not least I tried the REMBRANDT® 2 Hour Whitening Kit. When I saw that it took 2 hours, consisting of 4-20 minute sessions with 10 minute breaks in between, I honestly didn't think I would have time to do this. It sounded pretty complicated. So, I finally gave it a try today and I have to tell you that just because you are busy doesn't mean you have to totally block out 2 hours of your day to do this. All you need to do is heat the mouth trays in hot (not boiling) water until they start to lose their form. Then, you put them in your mouth and bite down on them, molding them to your teeth using your lips and tongue. Next, put the whitening gel into the mouth pieces and insert them back into your mouth for 20 minutes. Once the 20 minutes are up, rinse your mouth and the trays with water and wait for 10 minutes. You repeat this process until all the vials are used up...you have plenty for 4 applications. I found that the taste was not bad and that it was very easy to do. I am a non-complicated person so the easier something is, the better I am at it! I also found that I didn't need to do 4 full applications today as my teeth are not stained at all. So, I have more for another day! One thing that I did not like was the fact that my teeth felt sensitive after using (which is normal). I also noticed that the peroxide burned a bit on the second application when it was swallowed. BUT, I was THRILLED with how white my teeth looked!! I was very impressed that this product from Rembrandt worked so well for me. So, in my opinion...Getting a brighter and whiter smile could not be any easier. I love all of these whitening products from REACH and Rembrandt. While the peroxide flavor is not the most pleasant, the results of using it are amazing! I would definitely recommend these products to anyone... especially those of you who are struggling with stained and dull looking teeth. Fantastic products!! Disclaimer: I received no monetary compensation for this post. I did receive free REACH and Rembrandt products for review purposes. All quotes and stock photos are from the REACH and Rembrandt websites and email. Prize is being sponsored and shipped by the sponsor. All thoughts and opinions are 100% mine. I want to win because I love Reach toothbrushes and rembrandt toothpaste. Depply white 2 hour whitening kit is what I would like to try. I would like to try the REMBRANDT® INTENSE STAIN® Toothpaste. I want to win this product because I am trying to find a something that will help whiten my teeth. I want to win because I would like whiter teeth. I'd like to try Rembrandt Intense Stain Toothpaste. I'd like to win because I have great experience with Rembrandt and Reach products. I would like to win because my teeth could use some whitening. I hate the discoloration. REMBRANDT DEEPLY WHITE 2 Hour Whitening Kit. I would love to win this giveaway because my teeth really need a good whitening! It would make me feel better about myself. I would like to win the REMBRANDT® DEEPLY WHITE® 2 Hour Whitening Kit as it works quickly. I would like to try the REMBRANDT® INTENSE STAIN® Stain Dissolving Strips. I want to try the Stain Dissolving Strips. REMBRANDT® INTENSE STAIN® Stain Dissolving Strips sounds great! As a coffee drinker I would love to try the REMBRANDT® INTENSE STAIN® Stain Dissolving Strips. I don't have dental insurance so I am forced more time between visits, this would give me the pick me up I need. I would really like to try out the Reach crystal clean toothbrush. Reach products are great and their toothbrushes always seem to do the best job. It must be the shape, they get to the back of your mouth more easily. I would like to try the REACH TOTAL CARE Whitening toothbrush. I would like to win this product because it would improve the quality of brushing my teeth. It would take less time to brighten my teeth, have fresh breath, and rinse if I have a toothbrush that does that. Depply white 2 hour whitening kit. I'm most excited to try the stain dissolving strip to hopefully do the most to fix my teeth! I want to try the Reach Total Care Floss Clean toothbrush. I'd love to try the REMBRANDT® DEEPLY WHITE® 2 Hour Whitening Kit. I need whiter teeth! I hate having to smile for the camera with a dull smile. i want to try the 2 hour whitening kit. i want to win because my teeth really need to be whitened! I would most like the REMBRANDT INTENSE STAIN Toothpaste to get rid of coffee stains. I want to try the dissolving strips. I would like to try the REMBRANDT® DEEPLY WHITE® + Peroxide Fresh Mint Toothpaste. I would love to try their intense stain toothpaste. I would love to win this because I am a huge coffee drinker and would like to restore the whiteness of my teeth. I would love to win because I'm an ex-smoker and my teeth show it. They could really use some whitening. I would like to win these products because I am always buying many teeth products for my family to try and these are all great products. As a coffee drinking, the stain removal strips from Rembrandt would be nice to have to take care of some, if not all, of the yellowing! I would like to try the Rembrandt Intense Stain Dissolving Strips. I want to win because I definately need whiter teeth! I love the intense stain strips! stain dissolving strips for sure! I want the REMBRANDT® INTENSE STAIN® Toothpaste for my husband as he still smokes! I've always appreciated a bright, white smile and I'd like to get mine back! I would like to try the Deeply White 2 Hour Whitening Kit. I would like to try the REMBRANDT® INTENSE STAIN® Toothpaste. Drinking coffee or eating foods that leave their remains on my teeth. I want to try the Rembrandt Intense Stain Dissolving Strips as I just quit smoking and hope this will inspire me to not go back! I would love to try the 2 hour deep whitening kit. I'd love to try the REMBRANDT® INTENSE STAIN® Stain Dissolving Strips. I would try Rembrandt's Whitening Kit. I want to try the Rembrandt Deeply White 2 Hour Whitening Kit. A Brighter and Whiter Smile with REACH and Rembrandt! I want to try the Rembrandt stain dissolving strips! I want the Reach Access Flosser. I would really like to use the INTENSE STAIN® Stain Dissolving Strips by Rembrandt because I think my love of coffee has begun to stain my teeth. I want to win this prize pack because my habitual coffee intake has started to stain my teeth. I smoke and drink coffee so I would like to win so I can make my teeth whiter. I want this because i just quit my cofee lol! I would like to try the reach total care and massage! I would love to try the Reach Total Care + Whitening Toothbrush! I already use Reach products, so would love to try Rembrandt. I would love to try the REMBRANDT® INTENSE STAIN® Stain Dissolving Strips. The 2 Hour Whitening Kit. I need whiter teeth fast! I would love to try the Reach Crystal Clean brush. 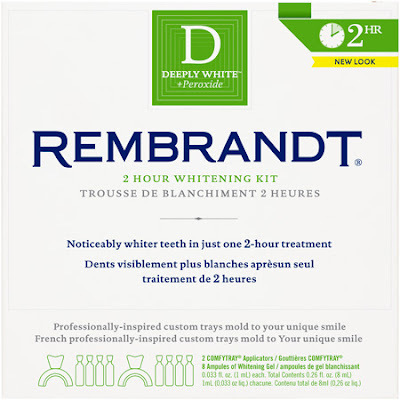 I would like to try the REMBRANDT® DEEPLY WHITE® 2 Hour Whitening Kit. 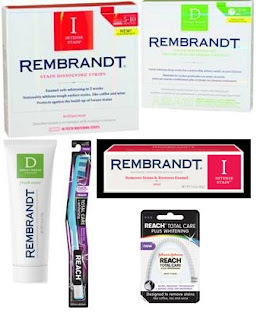 We'd like to try the Rembrandt Gentle White toothpaste - my husband would like that better than more intense versions! I'd also like to try the Reach Total Care Floss Clean toothbrush and see if the bristles really work more like floss! Reach Total Care Multi Action toothbrush. I'd like to try the Reach Total Care Floss Clean toothbrush. I'd like to try the Rembrandt Intense Stain Dissolving Strips. I could use the Rembrandt Intense Stain Dissolving Strips-really use! No dental insurance and have not been to the dentist in years. So pricey. DH has a broken tooth and one that needs to be pulled and yikes! I would love to try the Rembrandt intense stain toothpaste. I'd like to try the Deeply White + Peroxide Fresh Mint Toothpaste. I want to win so my teeth will be whiter! I want to win because I want my smile to be as bright as I feel inside. I'd love to win this product to try out a whitening system, I've never tried an at home one so it would be new to me. want to win because I drink to much coffee! i like the REMBRANDT® INTENSE STAIN® Stain Dissolving Strips. I want to try the reach crystal clean toothbrush!!! Thanks for the giveaway...REACH Deep Clean Floss. ...we want to try the rembrandt toothpaste ! wa nt to won sice my teeth so yellow ty. I'd love to try the REMBRANDT® 2 Hour Whitening Kit!